Scientific illustration originated thousands of years ago as a visual aid for medical texts. Centuries before cameras, these artists crafted perfect renderings of plants, animals, anatomy, equations, conceptual and hypothetical processes. 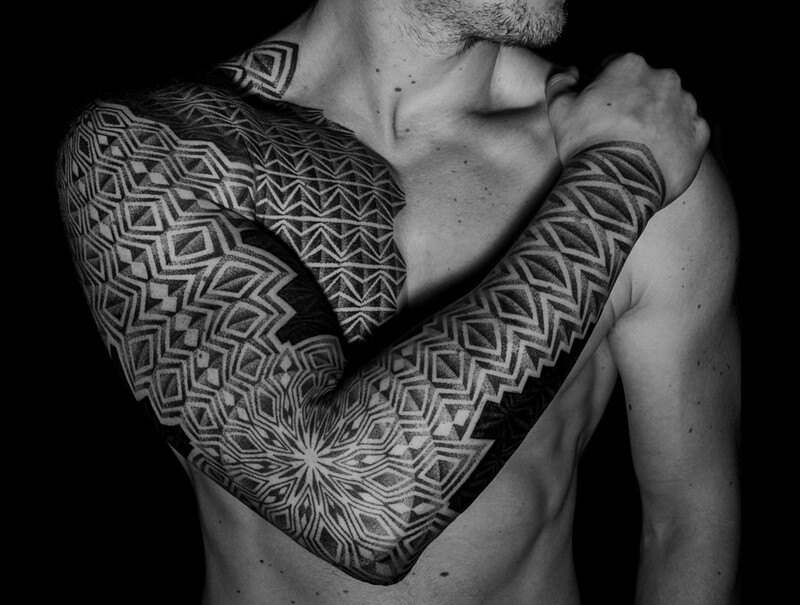 And now, this ancient tradition lives on, in a flourishing new tattoo trend. Possibly as a reaction to the influx of abstract art in the market, people around the world now seek concrete subject matter, delivered with surgical precision. Top: Coralberries by Ilya Brezinski. Antique Hatton Garden London timepiece by Delphine Noiztoy. 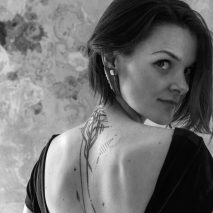 A master of realism, baroque and art nouveau, Delphine Noiztoy is a patient woman, devoting time and attention to intricate designs. Perfectionism is an asset, here. 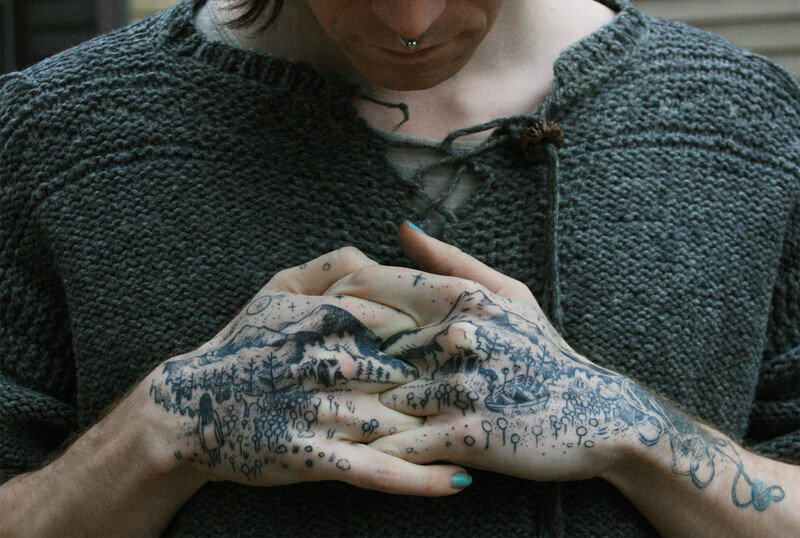 She’d rather place thousands of dots on 10 cm of skin, than risk compromising the piece with an easier technique. 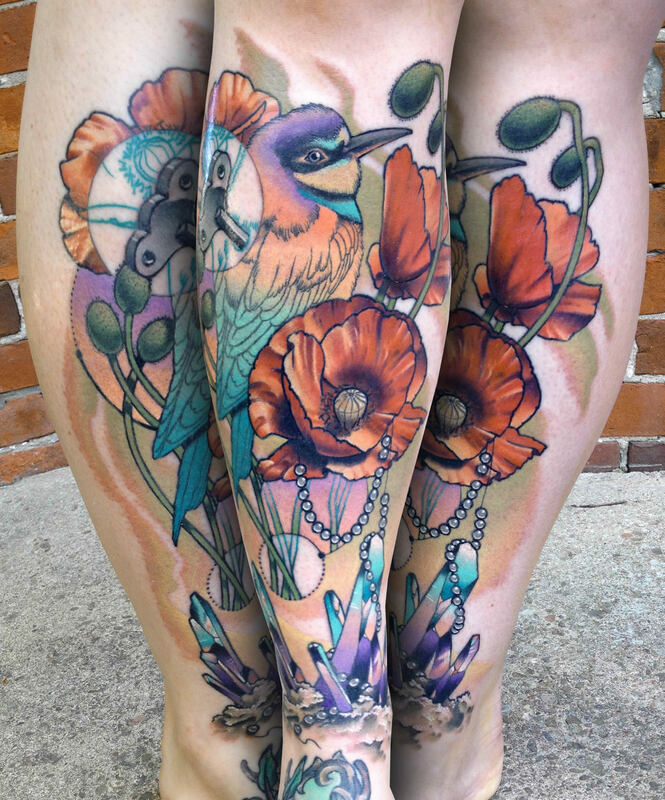 Based in London, she travels for guest spots worldwide, from Luxembourg to Chicago. 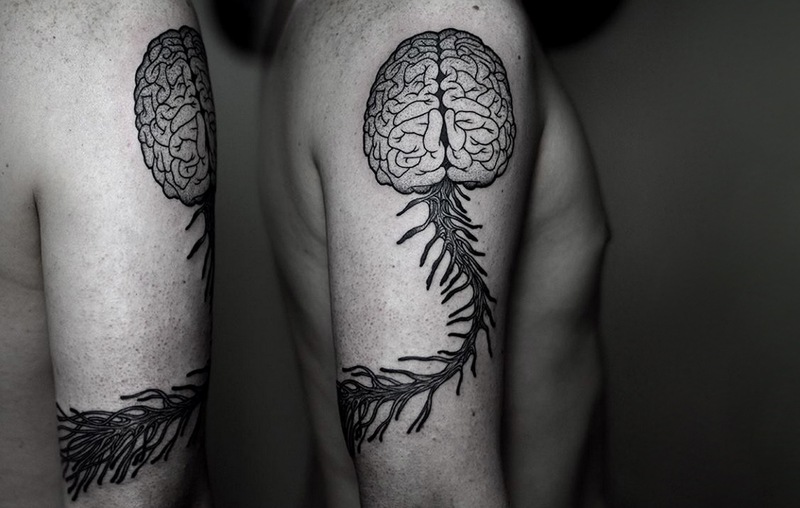 Brain and brain stem by Kamil Czapïga. Polish artist Kamil Czapïga’s designs range from objective realism to figurative geometry, often flirting with old-school themes. 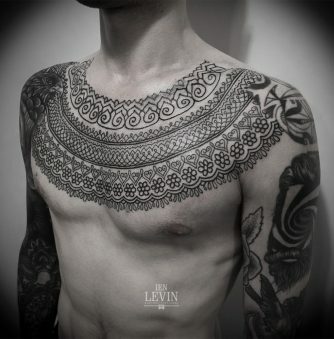 Dotwork gradients, used as a form of shading, always make the black ink pop. 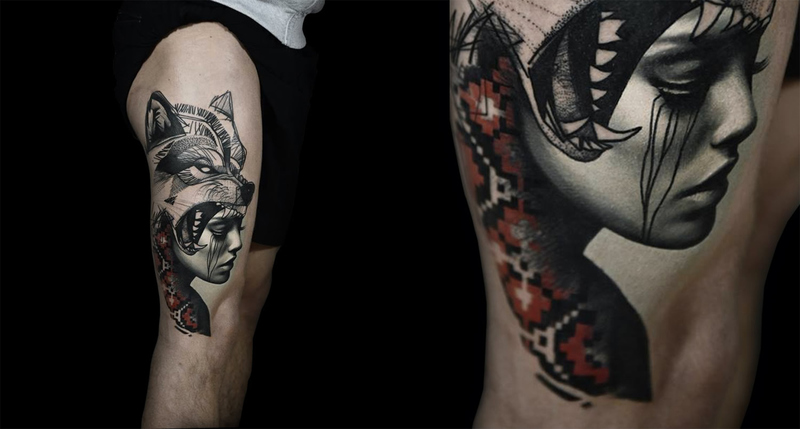 His high-contrast aesthetic is instantly recognizable, one of the many reasons clients travel thousands of miles just for one of his custom tattoos. Tree cross section by Brücius. Firmly planted in San Francisco, Brücius draws daily inspiration from endless sources: medieval engravings, wood-cut etchings, taxidermy, architecture, astronomy, Greek and Roman architecture, as well as biological, nautical and anatomical illustrations. His work is an ever-evolving testament to the majesty of nature and the fascinating history of all humanity. 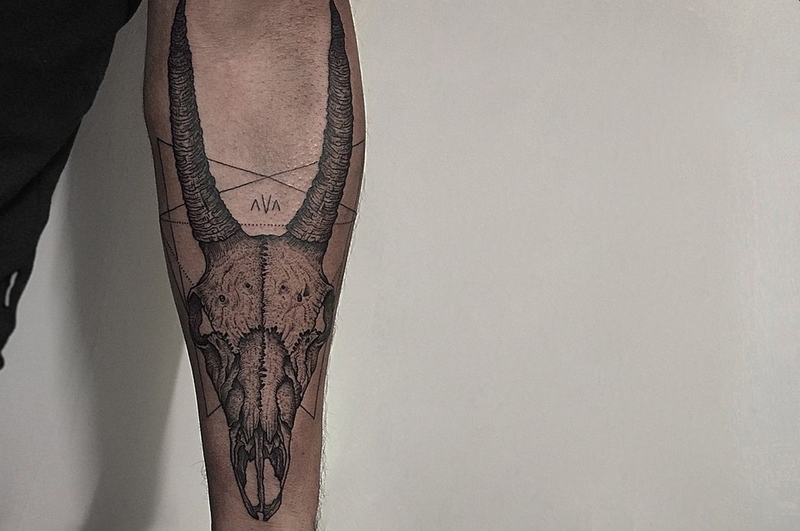 Antelope skull by Thomas Bates. UK-based illustrator Thomas Bates once made a living developing album artwork for musicians in the United Kingdom. Before long, he felt compelled to transition to the medium of skin. 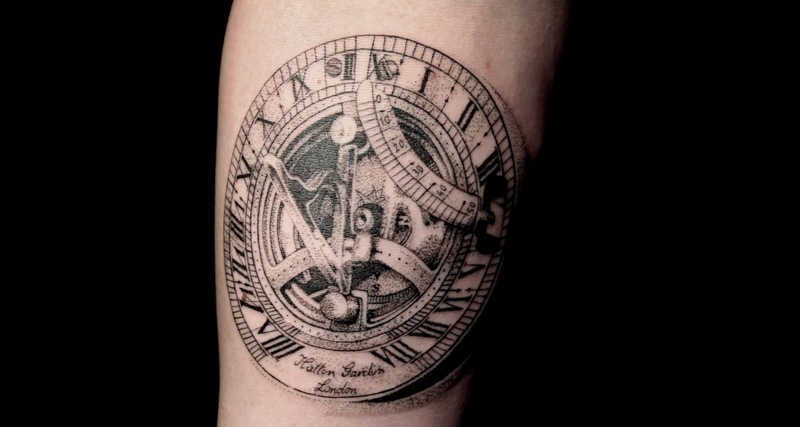 A full-time tattooer now for just over a year, Thomas’ trade specialties are dotwork, sacred geometry, traditional themes and scientific illustration. Skeleton torso by Vaigirdas Kofy. A talented up-and-comer, Lithuania’s Vaigirdas Kofy is a young master in the making. He began tattooing traditional flash just last summer, and soon expanded his skill set and his vision to include much more intricate elements. Stay tuned this year to see how his portfolio continues to grow. 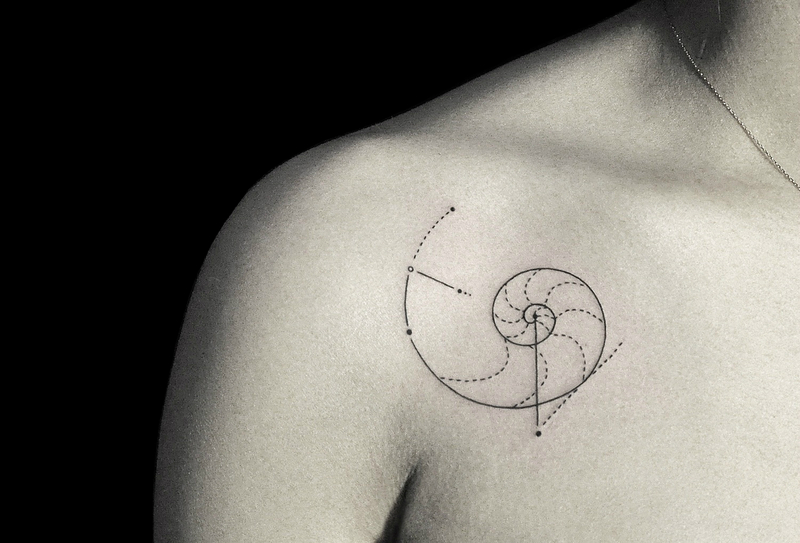 Minimal chambered nautilus shell by Bicem Sinik. Turkish artist Bicem Sinik specializes in micro, fine line illustrations. 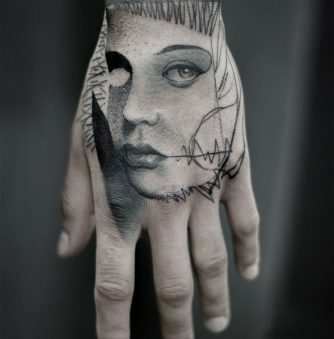 Time and again, her steady hand executes tiny, straight lines that would intimidate most tattooers. 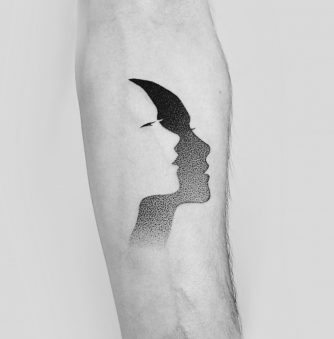 Incredibly minimal, her artwork serves as a constant reminder there is beauty and harmony in simplicity. 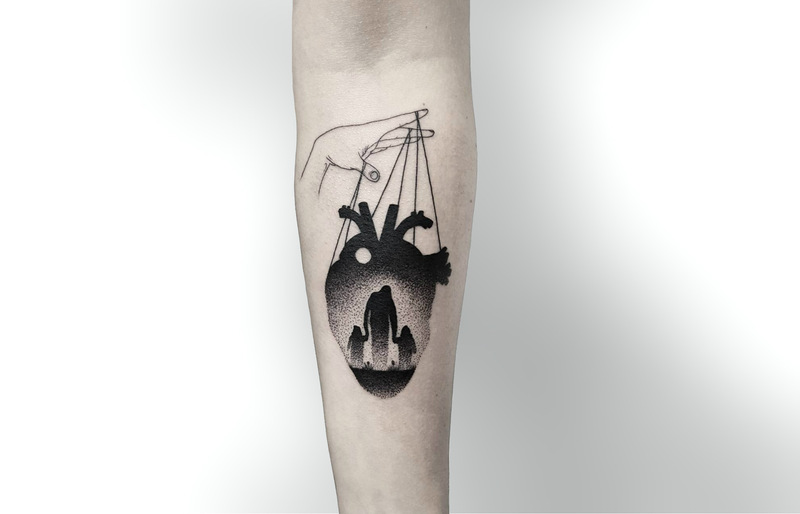 Street artist and illustrator turned full-time tattooer, Bouits was first featured in our “5 Tattooers to Look Out For in 2014” article. Her apprenticeship with Xoïl garnered attention worldwide, but she soon carved out her own niche and notoriety in the global tattoo community. Her portfolio is a lively mix of expressionism, primitivism, and digital graphic design. Brain in a ten-pointed star by LEITBILD. Daniel Meyer, a.k.a. 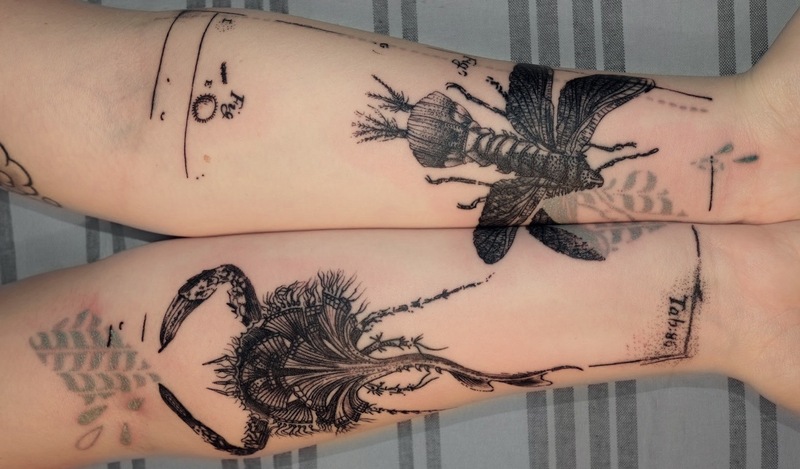 LEITBILD, is a German-born tattooer now based in L.A. Working only with black ink, like many artists in this set, his work always demonstrates the incredible range of colors between black and white. 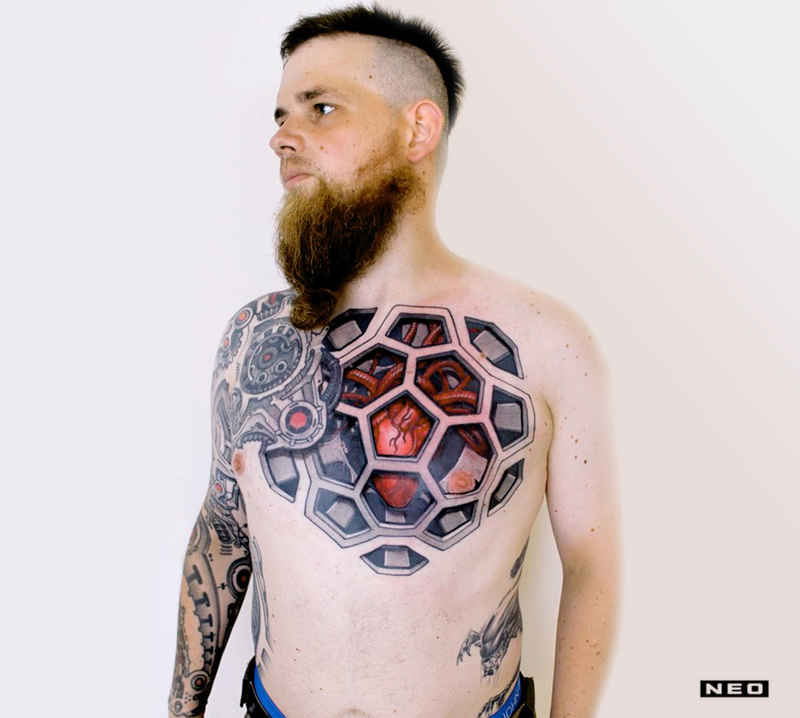 With an affection for sacred geometry, he tends to merge sacred symbolism with geometric patterns, a unique hybrid that is now his signature aesthetic. 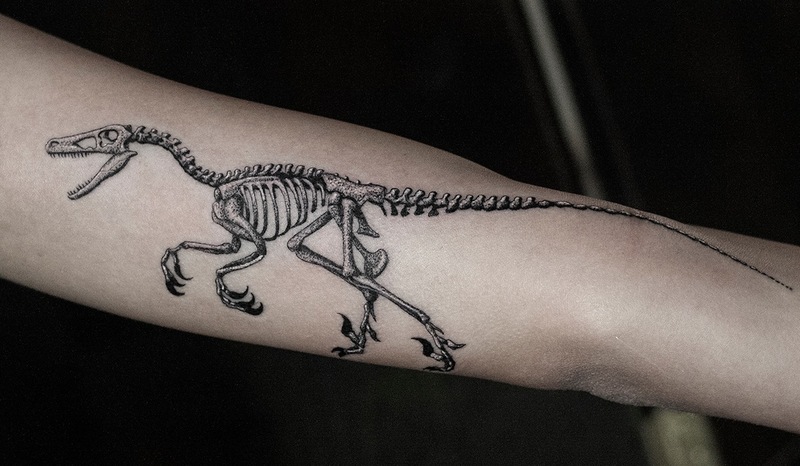 Velociraptor skeleton by Sven Rayen. Antwerp-based artist Sven Rayen can deliver photo-real portraits, polygonal structures, and detailed anatomical sketches. 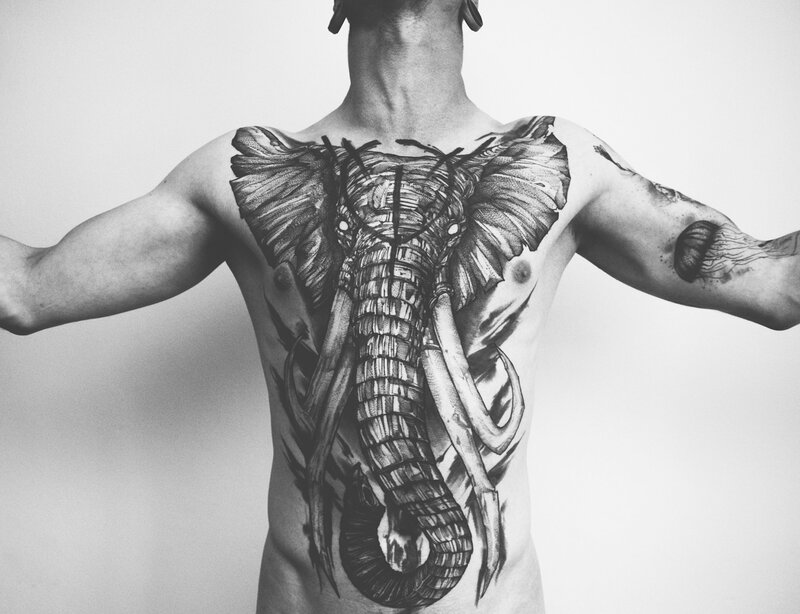 Occasionally highlighting monochromatic work with the ever-controversial white ink, many of his pieces shine with unusual luminosity. Now experimenting with a select color palette, it’s likely 2015 will add an even wider range of dimension to each design. 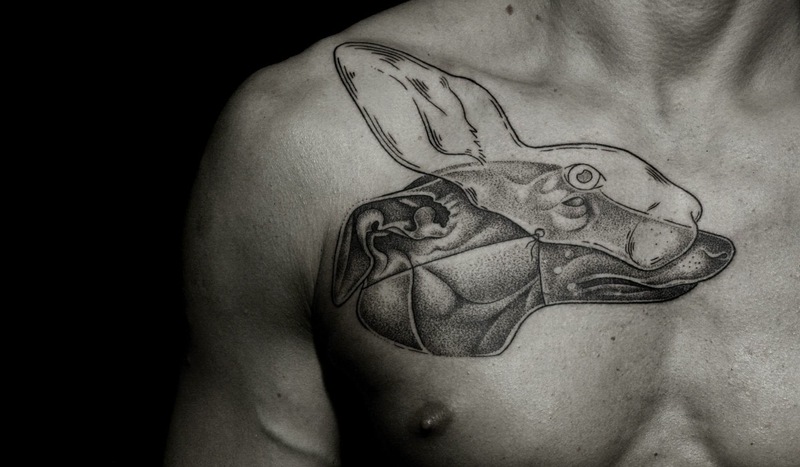 Greyhound in a hare mask by Ilya Brezinski. Belarusian-born illustrator Ilya Brezinski, now based in Saint Petersburg, Russia, is constantly developing new renderings of wild plants and animals. 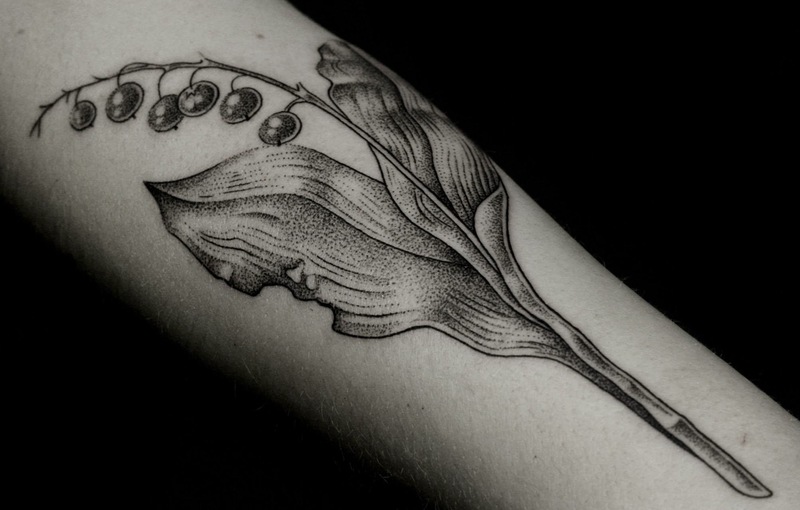 His tattoo work captures with great detail the veins of each leaf and the fibers of each muscle. And though he has a penchant for precision, he’ll always leave room for unexpected elements and playful surprises.